Start reading Endgames (The Imager Portfolio Book 12) on your Kindle in under a minute. Praise for L. E. Modesitt, Jr. The twelfth novel in L. E. Modesitt, Jr.'s New York Times bestselling epic fantasy series, the Imager Portfolio. I have, to the best of my knowledge, read every book Modesitt has published. I'm a huge fan. And I consider the Imager series to be one of his best. That is why I am so very disappointed in this book. Finishing the series with a book entirely from the point of view on a non-Imager political figure was a curious choice, but it could have worked. It does move the author into immediately tricky territory, since it means that there will not be the expected fantasy action we saw from various magic users earlier in the series, nor the military action that we saw from other characters. Modesitt chose to end a series that is basically military fantasy with non-military non-fanatasy. As I said, it could have worked. But it didn't. Modesitt has never been what anyone would call subtle about politics. But this book is filled with nothing else. And it is not the politics of Solidar; it is contemporary US politics without any effort to disguise it. You will be treated to the author's musings on environmental regulation, tax policy, minimum wages, gun control, consumer protection, and the impacts of automation. Does that sound interesting? It isn't. By mid-book, I was rolling my eyes hard enough that they hurt. The new Rex needs a bride, of course. The author provides a not-remotely-plausible excuse to have the courtship conducted almost entirely by letter. This enables him to indulge himself in pseudo-philosophical ramblings, as Charyn seeks to impress his love interest in a way reminiscent of a particularly pretentious undergrad holding forth in the campus coffee shop. Other reviewers mention the pacing issues, but try to talk around them by claiming that the truly thoughtful reader will appreciate the...ahem...deliberate pace of the book. No, not really. If there were something worth lingering over, perhaps the pace would not have been an issue. But if I'm going to get off the highway and spend twice as much time taking the scenic route, there had better be some scenery worth viewing. I nearly forgot about the absurd and awkward Protestant Reformation theme, complete with theses nailed to a church door. Not kidding about that either. Oh, and apparently Modesitt has taken up playing the piano, and thinks you want to read hundreds of words about how his characters practice the piano. I wish I were kidding. I mean, I'm glad he has a hobby, everyone needs one. I just worry about what his next book will look like if he takes up stamp collecting. I gave this book two stars instead of one because while it is deeply disappointing, self-indulgent tripe, it is in places well-written deeply disappointing, self-indulgent tripe. Look, you have made it this far in the series, so you probably have to read it. Just prepare yourself for sad considerations of what might have been, if the author cared more about providing a decent end to the series. 4.0 out of 5 starsA strong, thoughtful entry in a fantasy series that I have deeply enjoyed. "Endgames" is the twelfth book in Modesitt's Imager Portfolio, a fantasy series set in a world where a tiny fraction of individuals--Imagers--have a magical ability to create things that they imagine. It's the second book in the series centered on Charyn, born the eldest son of the ruler of Solidar. Out of forty fantasy novels that I've read by Modesitt, the two about Charyn are the only ones whose protagonist lacks fantastical abilities. Charyn, especially in this second book, is trying very hard to do what is best for his country, against considerable opposition, and he does so without possessing even a modicum of magic. As is probably clear by the number of books I've read by Modesitt (more than forty, since I've read some of his science fiction as well as most of his fantasy), I like his books very much. The style of "Endgames" might be perceived by some as dry; its pacing might be perceived as slow. I found it neither. That Charyn's efforts entail patience and diligence increases the book's immersive realism for me. 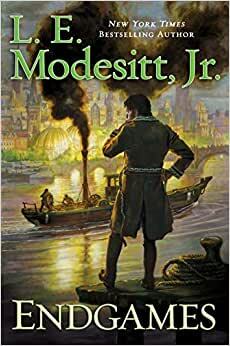 Most of Modesitt's protagonists are, like Charyn, male, but his secondary characters include strong, intelligent, interesting women, and happily "Endgames" is no exception to this. His books usually also include a romantic thread. In "Endgames" much of the romance was conducted via letters and poetry, and this was handled nicely. Modesitt is a thoughtful author, one who thinks out the economic, political, religious, cultural, and technological background of his stories. His fantasy oeuvre quietly examines the use and abuse of power, and the effect of different legal and political systems, though most of his other books do include more action and a higher bodycount than Charyn's story, which may give them broader appeal. I highly recommend the Imager Portfolio series in its entirety, and "Endgames" in particular. I hate to say that. I have everything Mr. Modesitt has written in a variety of formats. I was ready for angst, long rides and meal descriptions. What I wasn't ready for were pages and pages of philosophy and not much story. I was disappointed. 5.0 out of 5 starsThis book is probably not for everyone. This story reminds me of a slow stately dance or put another way, a detailed character study. If you are looking for dramatic action, this may not be for you, but for me it was a superb culmination of a young man coming of age as he struggles with the implications and transfer of power. Nicely done Mr Modesitt.